At the very western tip of Florence's Cascine Park is an interesting and peculiar mid-nineteenth century example of Italian Orientalism in the form of a monument dedicated to a maharaja who died in Florence while on route back to India from England. Someone seems to have had valued his visit enough to have dedicated a rather impressive, if now somewhat decrepit, memorial to the Maharajah of Kolhapur - Rajaram Chuttraputti. All of the ornamentation was done with care. The roof is adorned with peacock finials and bas-reliefs. 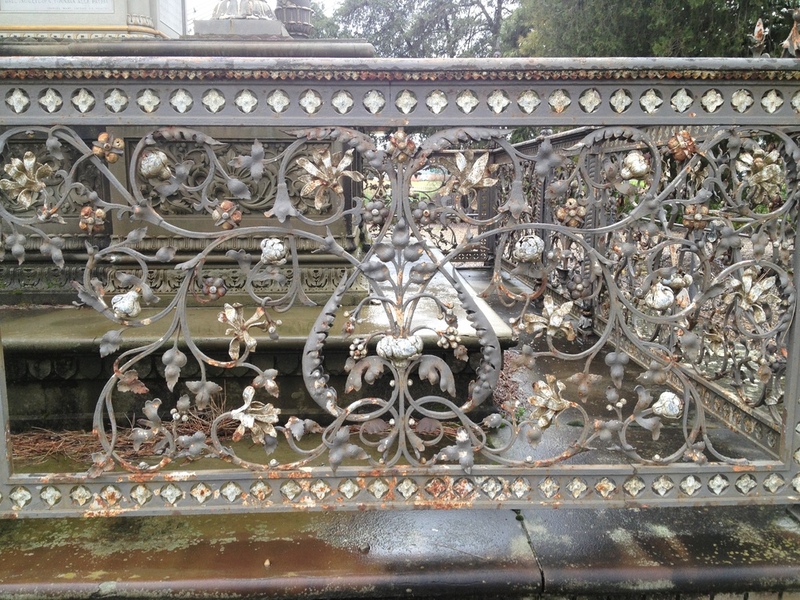 The grating consists of exquisite floral forms in the shape of magnolias, and what may be columbine and hydrangea. The whole of the monument must have been quite colorful when new. Much of the metal has been painted over, but colored enamel can be seen where the top layers are flaking. The interior of the dome is still a wonderful blue, and there are extant chromatic elements on the roof exterior. The story of Chuttraputti's cremation is also rather interesting and is spelled out in this article.